Abstract: Discrepancies between dental and facial midlines are not uncommon and these may have a dental or a skeletal cause. When planning orthognathic surgery, a decision must be made whether to accept or correct these. 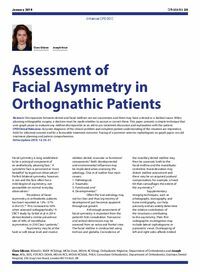 This paper presents a simple technique that uses graph paper to evaluate any midline discrepancies as an aid to pre-treatment discussion and explanation with the patient. Clinical relevance: Accurate diagnosis of the clinical problem and complete patient understanding of the situation are imperative, both for informed consent and for a favourable treatment outcome. Tracing of a posterior-anterior cephalogram on graph paper can aid treatment planning and patient comprehension. Author notes: Clara Gibson, BDentSc, MJDF RCS(Eng), MClin Dent, MOrth RCS(Eng), Orthodontic Registrar, Department of Orthodontics and Joseph Noar, MSc, BDS, FDS RCS DOrth, MOrth RCS, MOrth RCS(Ed), FHEA, Consultant Orthodontist, Department of Orthodontics, Eastman Dental Hospital, 256 Gray’s Inn Road, London WC1X 8LD, UK. Objective: To describe a non-invasive method of quantifying dental and facial midline deviations using a posterior-anterior cephalogram.